Field Contols are the main building blocks of Content views. They generate the HTML controls responsible for the input or output of the displayed Content’s fields. Field controls are implemented as ASP.NET controls, they can be used in the ascx source of the content views. 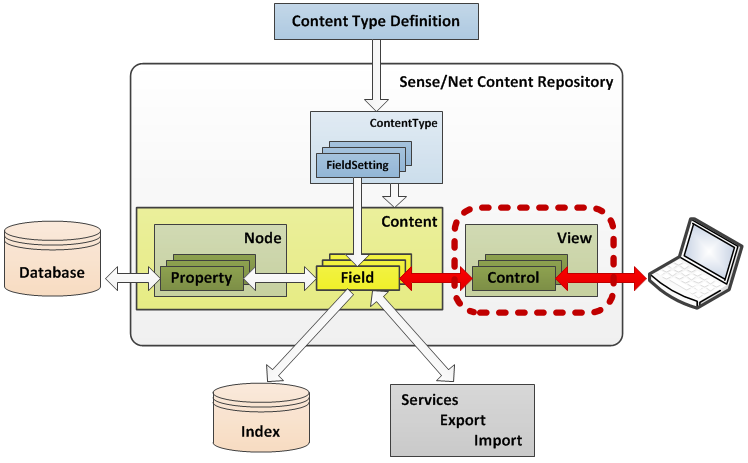 The field control class is responsible for the data flow between user interface and appropriate Field of the viewed Content. Manually registering the sn prefix for built-in controls is unnecessary, since it is registered in the web.config. If you create custom field controls you will have to register a tagprefix for the corresponding namespace. There are numerous built-in field controls you can use in content views out-of-the-box. Any built-in field has at least one corresponding built-in field control in the sensenet Content Repository. FieldName (*) - Gets or sets the fieldname of the Field Control. This is the name with which the control is mapped to a Field of the underlying Content. ControlMode (*) - Gets or sets the control mode: Browse, Edit or None. FrameMode (*) - Gets or sets the frame mode: NoFrame, ShowFrame or None. Field - Gets or sets the underlying field. ContentView - Gets the content view that is the parent of this control. Content - Gets the content that belongs to the underlying field. ContentHandler - Gets the Node that belongs to the underlying field. ReadOnly (*) - Gets or sets whether the control is read-only. If true control will not be editable on the user interface. InputUnitCssClass (*) - Gets or sets the class of the wrapper tag of the control. FieldIsCompulsory - Indicates whether the underlying field is compulsory. HasError - Gets whether the field control is invalid (has the ErrorMessage set). ErrorMessage - Gets error messages related to the field control.